(April 3): Asian currencies edged higher on Monday, as upbeat South Korean trade numbers lifted the won, while the Indian rupee and Thai baht rose to their strongest levels since 2015. 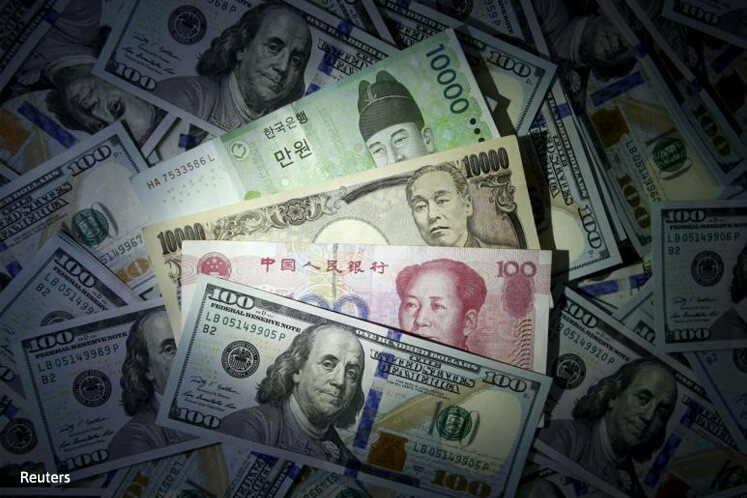 The won rose 0.5% against the greenback, leading the gains among emerging Asian currencies, after data showed that South Korea's exports grew more than expected in March thanks to stronger global demand. Underscoring the generally firm tone in Asian currencies, the Thai baht touched its highest level in more than 20 months at around 34.285 per US dollar. "What is most important for Asian currencies right now is that economic conditions in Asia are stable," said Masashi Murata, currency strategist for Brown Brothers Harriman in Tokyo. Solid economic fundamentals in the form of surpluses in trade balances and current account balances are helping support Asian currencies such as the won and Thai baht, Murata added. The gains in Asian currencies came in the wake of the US dollar's retreat from a two-week high set against a basket of major currencies on Friday. The dollar index last stood at 100.41, trading below Friday's peak of 100.65. New York Fed President William Dudley said on Friday the Fed could begin trimming bond portfolio this year — earlier than many economists expect — but also said that it was in no rush to tighten monetary policy. US economic data released on Friday was mixed. Consumer spending barely rose in February amid delays in the payment of income tax refunds, but inflation marked its biggest annual increase in nearly five years. The Indian rupee hit its highest level in nearly 1½ years in the wake of strong foreign buying in domestic markets. The rupee touched a high of 64.765 per US dollar at one point, its strongest level since October 2015, while India's NSE stock index hit a record high earlier in the session. India's central bank said on Friday that it would increase foreign investment limits in government bonds and state development loans for the April-June quarter by 110 billion rupees (US$1.7 billion) and 60 billion rupees, respectively. *China, Taiwan markets are closed for holiday on Monday and Tuesday.